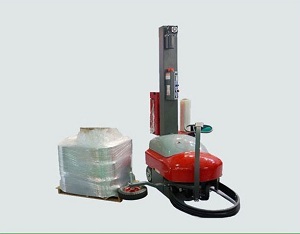 Robot pallet stretch wrapper is the reliable and solid stretch wrapping robot for palletized loads package and pallet wrapping. Delivered from professional team, Robot stretch wrapper continues to be recognized pursuing the design and style, positive and basic safety standards used on robots possessing greater performances. Robot pallet stretch wrapper is simple to operate but as well it has been analyzed to get a normal manufacturing use, keeping under consideration one of the most various and high work problems. Film carriage with mechanized braking and pre-stretch system on return roller that permits constant film elongations no matter the film reel diameter. The braking process comes with fast on/away from gadget to aid film hooking to the bottom of the pallet. The brake intervenes in the rubber curler to permit wrapping anxiety adjustment. Any additional metal rollers are situated concerning guarantee an increased film accept round the braking roller. 1) There is no need installation and commissioning. 2) No limit for pallet size in almost any dimension. Battery 230 V - 50/60 Hz - 1 PH Min. Practical experience is our strength; our market professionals possess a vast knowledge and understanding in the client's requirements which we serve. Our in-house crew undertakes all installation, manufacture and design routines to consumers exacting specification and standards.